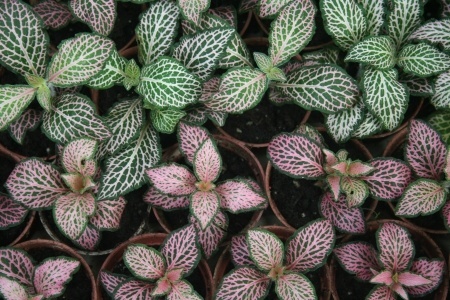 The Fittonia Nerve Plant has striking, compact foliage of lush green leaves that are beautifully etched with a network of brilliant white or red lines. Argyroneura Group plants has dark green leaves with white veins and Verschaffeltii Group plants has dark green leaves with red veins. It is native to the tropical rainforests in South America and is also knows as the Mosaic Plant. You will find these plants growing as ground covers in the shade under trees. The plant forms a great cover because of its fast-growing root system that fills the container and cascades down the sides of the pot. The plant bears small, insignificant flowers that should be pinched off to focus on the beauty of the foliage. The good quality about this plant is that it looks wonderful in a hanging basket, a terrarium, or in a tabletop garden. As an indoor houseplant it can be quite demanding when it comes to water. They need more frequent watering than most houseplants. You must not allow it to dry out. You should mist plant with tepid water or use other means to keep the plant's humidity up. LIGHT: Medium light (near bright east or south window), but no direct sunlight. TEMPERATURE: Keep plant warm 60° to 80°F (15° to 27°C). Can tolerate 50°F (10°C) without damage. WATERING: Water and drain off the excess. Be careful not to over water as the leaves will turn yellow and drop off. You should water less during winter when plant is resting. POTTING MIX: The plant prefers moist potting mixture at all times. Use a well-aerated potting mixture containing 50% organic matter. The potting mix must hold enough water yet drain well to prevent soggy soil. HUMIDITY: The plant must have high humidity. If tips and edges of leaves turn brown, raise the humidity levels by placing plant on humidity tray or get a room humidifier. A terrarium would be the ideal environment for this plant. FERTILIZATION: Feed plant monthly with a water soluble plant food diluted to 1/2 the recommended dose. This should be during the active growing season. PROPAGATION: Root stem cuttings of 2 to 3 inches (5 to 7.5cm) or division of plant. GROOMING: Prune and shape plant every 3 months to keep plant attractive. Repot in winter or early spring if the plant grows rapidly. PESTS: Check for mealybugs at leaf nodes and axils; if present, spray with appropriate pesticide. Keep your Fittonia Nerve Plant in a warm, humid environment for best results.